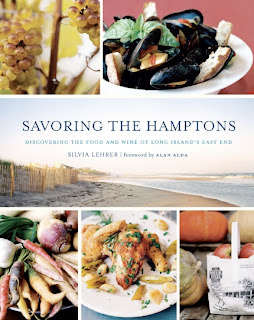 In June, I finally met the dame of locavore food and wine in the Hamptons, Dan's Papers columnist, and author of Savoring the Hamptons, Silvia Lehrer. Silvia, much to my delight, attended a workshop I led at the International Association of Culinary Professionals conference in Austin. Since then, we've corresponded via email, and talked about cooking together once her hectic (and successful) book signing schedule is finished. Savoring the Hamptons is a delightful and informative book that takes you on a journey through the seasons to meet the people behind the wineries, farms, artisanal foods, and restaurants on the North and South Forks of Long Island. The book includes dozens of beautiful photographs, engaging stories and delicious recipes that feature ingredients that Long Island is famous for and I've written extensively about: apples, berries, calamari, local cheese, clams, corn, crab, duck, many local fishes, lobsters, mussels, potatoes, peaches, scallops, and lots of lots of vegetables, particularly locally grown tomatoes, and, of course, our award winning wines. With Savoring the Hamptons and Silvia Lehrer as my trusted adviser, I made a much talked about around our family's table dinner last night using mostly locally grown produce. Pappardelle of Zucchini and Summer Squash -- see page 140 of Savoring the Hamptons or check out my adaption below (I didn't have summer squash, and decided to eliminate the half and half) as well as Lehrer's original recipe with half and half, that sounds delicious and rich, and which ran on Relish.com. Corn silk and outer husks are removed. 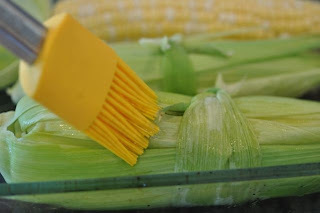 Then, corn is brushed with olive oil before being grilled. Grilled Corn on the Cob with Cayenne -- see page 133 of Savoring the Hamptons for the easy and wickedly good recipe -- a few swipes of olive oil on the corn before grilling and a dash of cayenne -- a wow for the taste buds. Slow Roasted Lamb and Chunky Sea Salt -- Savoring the Hamptons - see page 82 for the recipe. I decided not to use this recipe mostly because it was 100 degrees outside yesterday and I didn't want to turn on the oven. And, because slow roasted results in a well-done lamb and I was serving a bunch of folks who prefer their meat uber rare. In the fall or winter, I look forward to the awesome sounding red wine and au jus in Lehrer's slow roasted lamb recipe. Last night, I marinated a 6-pound leg of lamb in a vinaigrette of 6 cloves crushed garlic, 2/3 cup olive oil, and 1/3 cup local white wine vinegar and a tablespoon of oregano for four hours. 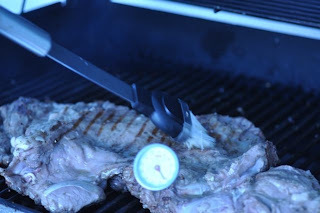 Then my husband grilled the lamb over a medium-high flame and basted it with a brush several times using a half a cup of lemon juice and a few ounces of melted butter until the internal temperature was 145 degrees (cook time is about 8 minutes on each side). The result was a blood red lamb that satisfied the tastes of half the diners (the other half of us cooked the meat a bit longer until it was done to our liking -- medium rare or well-done). Serve with mint sauce, mint jelly or honey mustard. 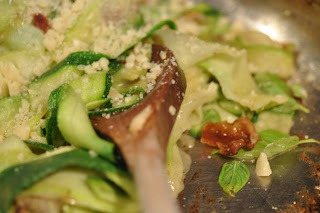 Pappardelle of Zucchini: adapted from Silvia Lehrer’s Savoring the Hamptons: Discovering the Food and Wine of Long Island’s East End (Running Press, May 2011). For Silvia's original recipe click here. Scrub the zucchini clean and pat dry. 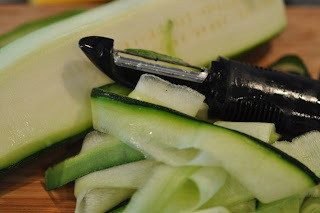 Using a vegetable peeler, peel the zucchini and squash lengthwise into thin wide slices (similar to wide Pappardelle noodles). Heat a 12-inch skillet over medium-high heat. Add the bacon, and sauté until crispy. Remove the bacon and set aside to cool before chopping. Add the garlic to the bacon grease and sauté about 30 seconds. Toss in the zucchini and squash and sauté for 2 to 3 minutes. Add 2 tablespoons of the Parmigiano-Reggiano and toss thoroughly to coat. Season with the nutmeg, Tabasco, and basil and stir to mix. Taste to adjust the seasonings, if necessary. Transfer to a serving dish, season with black pepper to taste, and serve. I cannot wait until leftover lamb for lunch and another batch of local grilled corn on the cob with cayenne ala Silvia Lehrer.Two thumbs up for her new book Savoring the Hamptons. 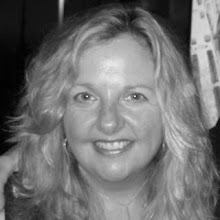 Please support you local bookstores and buy a copy of Savoring the Hamptons. Visit or order from BookHampton or Books and Books (Westhampton).